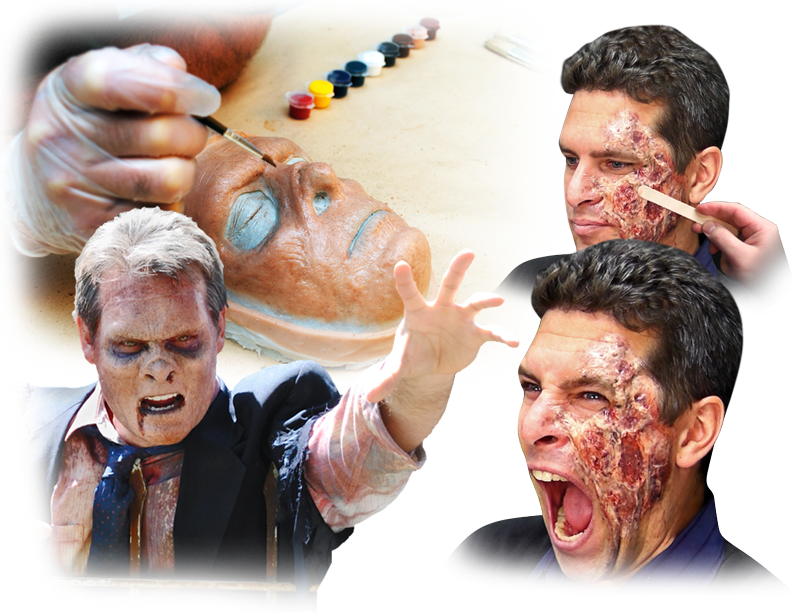 Makeup FX Tutorials by Smooth-On, Inc.
Smooth-On's wide variety of platinum cure, skin-safe silicone rubbers are used to create realistic skin effects. Ecoflex® and Dragon Skin® super soft silicones have become the industry standard for creating silicone masks and more. Adding SLACKER® additive creates a 'deadened' gel-like silicone perfect for realistic applicance movement. Ecoflex® GEL is 'pre-deadened' and makes a superb appliance filler. Dragon Skin® FX-Pro can be used as a membrane, or is soft enough to be used as a solid prosthetic appliance. Skin Tite® certified skin-safe silicone can be used to build up wounds and scars directly on the skin or as an adhesive for cast silicone appliances. How to create a silicone gel filled makeup prosthetic appliance using Q-Ballz™ and Ecoflex® GEL materials. The Ultimate Blood® Kit is the most realistic and versatile liquid blood system available anywhere. How to create a silicone gel filled appliance, paint the piece, and adhere it to the actor. Making and applying professional quality wound prosthetics. Jon N. demonstrates how to make a silicone wound directly on the skin using Smooth-On's Skin Tite® Ultimate Wound Kit. Smooth-On fan Leo V. shows how to make and apply a zombie makeup using the Ultimate Zombie Kit. Smooth-On fan Jon N. shows how he uses our silicone to make a wearable fake leg wound effect. In this makeup effects tutorial video, we create a Halloween zombie character using Smooth-On's Ultimate Zombie Kit. Skin Tite® is a versatile two-component silicone rubber product that can be used as an "On Skin" Sculpting Medium. In this makeup effects video, we demonstrate how to make a fake cut or making a wound using Skin Tite on-skin silicone rubber. Skin Tite® is a versatile two-component silicone rubber product that can be used as an on-skin sculpting medium. Learn how to do a slashed throat makeup just in time for Halloween using professional-grade skin-safe silicone. This effect is created using Ecoflex® 00-35 silicone, thickened with Thi-Vex®.